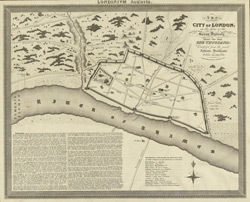 The title of this map of Saxon London, appears at top right, with a history of the city at the time of the Danish invasions in a panel at bottom left. A key to contemporary historical figures appears next to the compass rose at bottom right. The map gives illustrated views of prominent architectural and geographical features, with St Paul's Cathedral occupying the site of an old temple to Diana. Outside the walled city, Old Bourne (today's Holborn) is represented as a village on the banks of the River Wells on the Praetorian way.